Jaime Manriquez just needed to choose an elective. The high school senior had focused on athletics, until a computer course sparked his interest. For Manriquez, who had grown up playing Atari and Nintendo, the class unlocked a hidden talent. Soon, he was writing code, creating systems, and building networks. Now, twenty years later, he’s protecting a growing community bank from hackers and harnessing the power of technology to help his partners put a dent in a competitive industry crowded with international corporate giants. 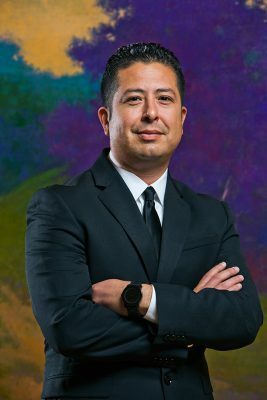 Manriquez was one of thirteen founders who started Santa Cruz County Bank (SCCB) in 2004, after bigger-box banks started acquiring smaller, local institutions. “The regional community bank was going extinct, and some business people in the Santa Cruz area wanted to provide a local banking alternative to the major corporate players,” he explains. Together, they organized to build a bank for the Santa Cruz community. After receiving their charter, the bank officially opened for business thirteen years ago. The community was receptive. After starting with $13.2 million in capital, SCCB opened three banking offices in just over a year and became profitable within eighteen months. Manriquez knew technology would play an important role in getting a fledgling bank off the ground, but he quickly discovered how much his business-minded partners would come to rely on his expertise. “Banking was becoming a high-tech industry,” he says of the era. “The right tech tools are required to design and run secure systems. Now, very little can be done in banking without a robust tech plan.” Essentially, Manriquez was taking what he learned from his professors at DeVry University, his partners in several start-ups, and his previous employers like IBM, and applying it to the banking space. At SCCB, he worked quickly to build a solid technology infrastructure, so the bank could roll out applications to customers while keeping their finances safe from online attacks. At that time, online security seemingly turned into a multi-billion dollar market overnight. Now, banks like Santa Cruz County Bank need internal-information security departments, and Manriquez is adjusting accordingly. He is increasing efficiency and automation, growing his team, and finding more ways to support Santa Cruz. SCCB intends to go from $520 million in assets today to nearly $1 billion in 2020. To meet that goal, Manriquez will have to build upon his reputation for providing the very best in service and security. As SCCB competes against the industry big boys, Manriquez has to do more with less. Not only does he lack the deeper pockets and bigger teams of those competitors—he also has a target on his back. “Fraudsters online assume that we don’t have the same controls in place as the major banks because of our size, so they think we’ll be easy to attack,” he explains. Any time SCCB plans a system upgrade or a conversion, he has to consider who might try to penetrate their system—and how. SCCB’s tech teams uncover targeted attacks on a routine basis. In fact, Manriquez says he deals with millions of attacks every day. Of those, just a few hundred are credible and targeted attacks. But a small tech team tasked with supporting a growing bank has more to do than fend off hundreds of attacks per day. That’s why Manriquez is tailoring his defense on email communication—where he sees the most attacks—and working with the Secret Service, FBI, and FDIC to share information and best practices. Special around-the-clock, automated monitoring alerts his team and takes corrective action when anomalies arise. While others might consider SCCB’s size a weakness, Manriquez says it’s actually an asset. “We’re agile. What would cost a megabank millions to implement costs us a fraction,” he says. A fast-moving team can exploit every security feature on every device. Additionally, because Santa Cruz is near Silicon Valley, Manriquez has been able to partner with emerging companies and technologies to grow his bank’s business. “Our customers drive our tech developments,” he says. In the last three years, his teams have implemented a Person to Person (P2P) payment system, mobile capture, and mobile banking. Now, they’re investing heavily on a virtual branch, eBanking, and other electronic delivery channels. Next, they’ll install new-generation ATMs and tokenizing programs that remove the need for PINs. As Google Wallet and Apple Pay gain wider acceptance, Santa Cruz County Bank will either select an existing mobile payment service or partner with another company to create its own. When it comes to his style and philosophy, Manriquez alludes to his days as a high school athlete. “We have to work as a team and realize no one person or department is going to bring us success as a bank,” he says. For IT, that means staying in constant communication to build trust with the board of directors and executive team. IT has to have company-wide support to be effective. And although Manriquez is already tackling a lot, he has to keep the other players aware of changing events and evolving threats in the tech landscape. The company’s buy-in is key. Not only is he continually updating the framework to mitigate risk—he needs capital investments to build delivery systems and meet consumer expectations. But Manriquez is in a good place at a bank with executives and partners who understand what it takes to operate in the modern era. Not only are his partners on his side—they’re looking to Manriquez to help take Santa Cruz County Bank well into the future.